This month we are supporting #noVANber, a campaign that has been launched by Peter Booth (@PBPlumber) to help raise awareness of van and tool theft which, sadly, is becoming more of a common problem for tradesmen and women in the UK. Having worked in the industry for several years, I am very aware of the impact that van crime is having on tradespeople across the country. Even for those with insurance, the loss of vans and tools can be detrimental for business as the time and money it can cost for repairs and replacements can result in long periods of time off work. This campaign is a great way to spread awareness of the problem and with the help of the government, offer compensation and justice for the victims of this crime that is having such a harmful effect on their business. The issue at the moment is that there is not enough punishment for those committing the crime, so the idea of the petition is for the Government to enforce something, whether that be introducing new legislation, new sentencing guidelines or regulations on the reselling of tools. 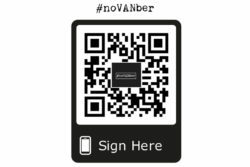 As part of the campaign, the hashtag #noVANber is being used across all social media platforms to spread awareness and a petition has been set up to encourage the Government to do more to punish the people carrying out these crimes, as well as provide support and compensation to the victims. The petition requires 100,000 signatures to be considered for debate in Parliament and since its inception on 1 November, it has already received over 32,500 signatures and this number is increasing daily. The petition will be open for six months in total, ending on 1 May 2019. I met with Peter last week to discuss how Sime can get behind the campaign. Over the coming weeks I will be giving out stickers and Sime will be participating in social media activity to encourage installers to share and sign the petition. If you haven’t signed it yet, please do so here: https://petition.parliament.uk/petitions/231177. You can also buy official #noVANber merchandise, including hoodies and t-shirts here: https://www.ofmg.co.uk/printing/novanber-campaign. All profits made from purchasing these items will go to Band of Builders, a charity run by tradespeople to provide support for other tradespeople in need.